According to the U.S. Department of Health & Human Services, Alzheimer’s disease currently affects 5.4 million Americans (50 million people worldwide). With our aging population ballooning, the number of people affected by Alzheimer’s and related dementias is expected to more than triple by 2050. Alzheimer’s is the sixth leading cause of death and the only leading cause without prevention, cure or survivors. Scientists have been trying to understand the brain and Alzheimer’s for over 100 years. Mapping the brain is extremely expensive and time consuming and while there have been breakthroughs in early detection, we are still far from discovering a cure. It now appears that breakthroughs will affect those in the very early stages of the disease. While scientists race for breakthroughs, what happens to the millions of people currently living with Alzheimer’s or some form of dementia and those soon to join their ranks? It’s a slow, long process. This deadly disease, once diagnosed, has an average lifespan of 10 years and has been known to drag on for 20 years and more. It is also believed that Alzheimer’s begins decades before diagnosis. Alzheimer’s is an expensive and exhausting disease. According to Alzheimer’s Disease International (ADI), in 2018 the global annual cost of care for people with AD and related disorders reached $1 trillion expected to reach $2 trillion by 2030. 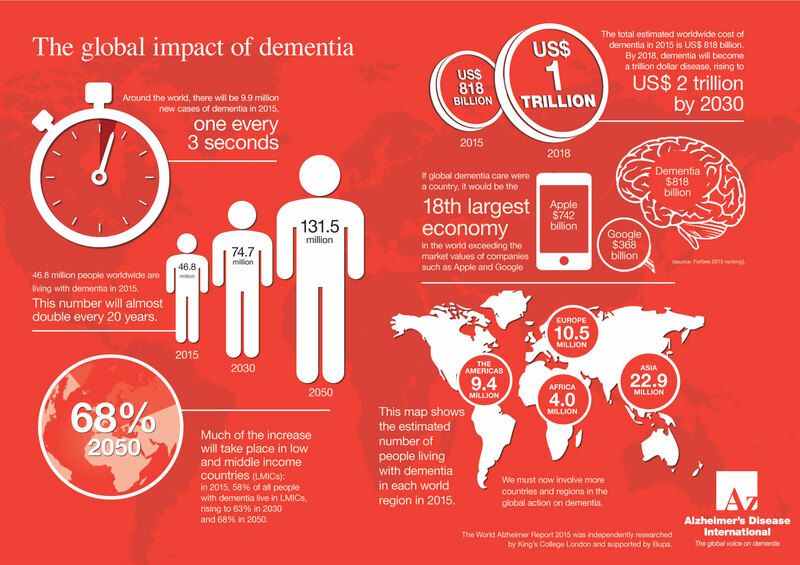 If global dementia care were a country, it would be the 18th largest economy in the world exceeding the market values of companies such as Apple and Google. Given the growing elderly population and their longer life expectancy, this is not sustainable. The extraordinary cost of AD is due largely to the progressive nature of the disease, the heavy caregiver burden and the inability of a person in the later stages of the disease to effectively advocate for themselves. Alzheimer’s is a lonely disease. We need better programming and trained professionals to improve the experience of living with Alzheimer’s. As the needs rise and even as awareness is rising, memory cafes and dementia friendly neighborhoods are helping, government funding is stretched and budget cuts are hurting our most vulnerable older adults. Effective programming (to help mitigate exhausting and sometimes dangerous behaviors, often stemming from a person’s frustrations at not being heard or understood) are being cut and eliminated. Adult day programs are also being cut. And there are not enough trained professionals to address the growing care needs. Alzheimer’s is perhaps the most profound women’s health crisis of all time. Here in America, of the 5.4 million people living with Alzheimer’s, 3.2 million of them are women. Not only are approximately 67% of people diagnosed with Alzheimer’s women, most of the care partners, both paid and unpaid, are also women, many of whom are also mothers of daughters. We believe the answer lies with our youth. Young people have the unique ability to immediately and directly revitalize an isolated adult in need and mobilize diverse communities to work together for change. They are also our future policy makers, doctors, lawyers, advocates, scientists and providers of care. Could Alzheimer’s be the great unifier? While our world becomes increasingly divisive and people search for meaning and purpose, this universally devastating disease can empower our youth and bridge our communities.